Imagine for a moment that you’re standing in the expo hall of the 2016 Presbyterian Youth Triennium, an event that boasts an attendance of close to 5,000 teenagers from all over the country. The atmosphere is charged with the drone of several hundred teenagers as they travel among the various booths. Like bees buzzing from one flower to the next, they hover at each table for only a moment, because they too are on the hunt. But instead of pollen, they gather a random assortment of pens, stickers, stress relief balls, and other new and exciting giveaways, each bearing the logo of different ministry organizations. At this Triennium, however, there was one booth, where those busy bees lingered longer than normal–UKirk Collegiate Ministries. At café tables and scattered over the floor, teenagers and their leaders clustered into groups to play a little card game called UGrad. What is UGrad you ask? 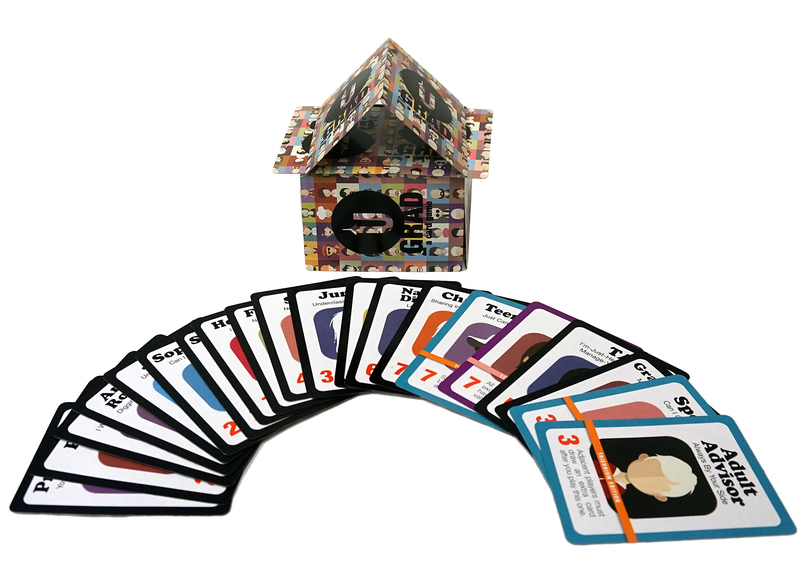 At face value, it’s simply a quick, easy to learn, character-based card game with a campus ministry theme. But when we dig a little deeper, it’s actually a powerful little tool to help create community in our college ministries. In its inception, it was designed with the purpose of bringing people together. Why design a game for campus ministry? After visiting dozens of campus ministries over the past few years, I started witnessing an unfortunate trend. The first fifteen minutes of the average collegiate ministry is without question the most awkward part of the gathering. While some students mingle with the group, many of the motley assortment of undergrads just hang around until the meal is served. Then, one night, I was playing a little game called Love Letters with one of my colleagues. It struck me that if I reworked the core mechanics with a collegiate theme, it would make a great quick game for those first awkward fifteen minutes. A few weekends later, I started fiddling with the idea again and ended up designing a prototype for the game. Several versions later, I decided to test it with a few PC(USA) collegiate ministries. I got great feedback and adapted the game to meet those suggestions. When all was said and done, I finally had a fully playable prototype. The next step was design and production. Truth be told, I’ve always loved design, so I shifted to the right side of my brain and began designing the artwork. I used free vector graphics found on the Internet and located a reputable printing company based in Chicago. Twelve weeks later, 2,000 copies of UGrad arrived at our national offices and the project was finally complete. With only weeks to spare, the Presbyterian Youth Triennium was the perfect venue to debut the card game, and the rest is history. Since its debut, I’ve been asked many times, “How is this a good resource for our collegiate ministries?” Or, even more, “How does a card game contribute to their faith formation?” In light of those questions, I’d like to identify three ways I believe a little collegiate ministry-themed card game can help students connect to their faith. First, it’s fun. Yes, faith formation can sometimes be fun. It gives college students something fun and inviting to do when they walk through the doors of their collegiate ministries. It’s one of those “third things” that allows everyone to participate on equal footing. It functions as a social lubricant that takes effect the moment someone says, “Hey, anyone want to play UGrad?” It’s something that draws people into an activity, notably characterized by laughter and smiles. Feeling comfortable in a formative environment, for many young people is the first step to letting down their guard. Not to mention, it’s a great segue into the communal meals that formally kick-off the night for many collegiate ministries. Second, it’s communal and ironically hospitable. The students’ engagement in the game is an experience in the essential communal connection that lies at the core of all faith formation. For the past half-century we’ve seen the ugly offspring of a growing ethos of individualism in our culture. UGrad and similar creations look to combat that emphasis by inviting others to be in community through legitimate participation. When I was designing the game, one of my biggest hopes was that it would bring people together. If the Triennium was any indication, I’d say that it accomplishes that task quite well. Communal interaction leads to communal engagement, which has and continues to be a hallmark of Reformed theology. Finally, this particular creative project has a validating effect on those for whom it was designed—the students of UKirk. To date, we are the only campus and collegiate ministry association with its own game. Seeing cards with characters from a campus ministry environment is validating of the socio-religious context in which we base our ministries. Two cards—the campus minister and the chaplain—are at the center of that validation. 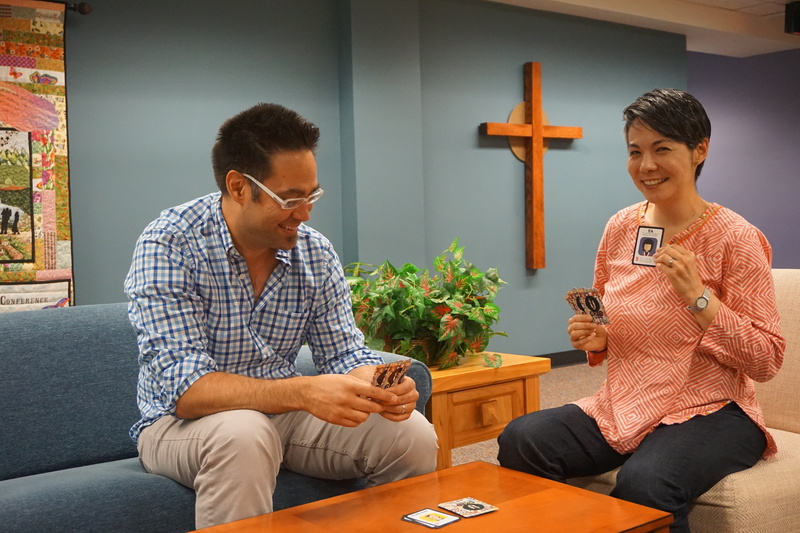 For the students for whom the collegiate ministry world is new, playing a card game that normalizes that formative environment helps them assimilate and feel connected. Please hear me when I say that I’m not trying to super-spiritualize UGrad into more than it is–a fun little card game that spawned out of my own passion for board games and my love for collegiate ministry. Its formative power, however, can be found in how we intentionally employ it as a tool for ministry. In the end, I guess we never know how God might use the little things in life to draw people into Christian community, and in this case, even a little card game. Jason Brian Santos is the Mission Coordinator for Christian Formation (Christian education, children, youth, college, young adult, camps and conference ministries) at the Presbyterian Mission Agency. He also serves as the National Director of UKirk Collegiate Ministries. He is an ordained teaching elder in the PCUSA and holds a Ph.D. in practical theology from Princeton Theological Seminary. He is the author of  A Community Called Taizé (IVP, 2008) and  Sustaining the Pilgrimage (IVP Academic, forthcoming). He currently resides in Louisville, KY with his wife, Shannon and their two sons, Judah and Silas (aka Tutu). In his spare time, he plays and designs board games.